Effect of DSA on bronchopulmonary system | Prof. Alina V. Chervinskaya, M.D., Ph.D. 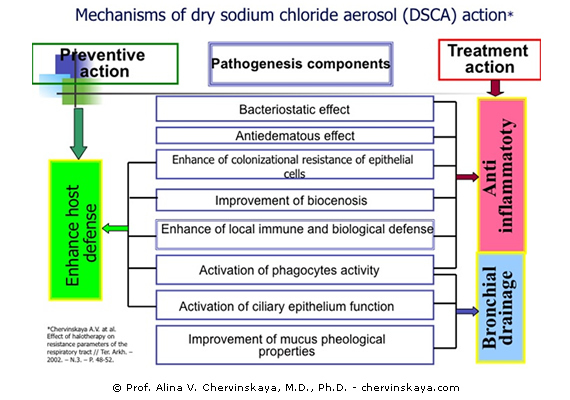 Examination of dry, fine-grained sodium chloride aerosol impact on various mechanisms of pathogenesis and sanogenesis in respiratory tract showed that halo-aerosol stimulates specific protective mechanisms of the respiratory tract, possesses a cleansing (mucolytic and bronchial drainage acting), anti-inflammatory and immunomodulating effects. Not only its antimicrobial (i.e., bacteriostatic) effect was proved, but also the change in a balance of conditionally pathogenic and normal microflora towards the improvement of biocenosis of the mucous membrane, that points to an enhancement of its resistance. 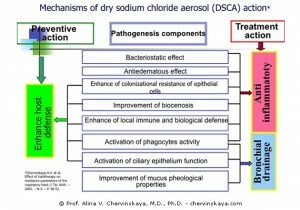 Thus, dry fine sodium chloride aerosol ensures mucolytic, bronchial drainage and sanitary acting, anti-inflammatory and immunomodulatory effects on the respiratory tract.